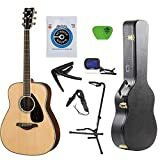 Yamaha FG830 Guitar Review 2019 – is the Yamaha FG830 acoustic guitar worth the money? Review of features, pricing, design, sound and more. The Yamaha FG830 is a seamless cross between traditional design and pro features. The FG830 belongs to the FG series of Yamaha acoustic guitars that are known for their excellent features and great build. The premium build and materials used in the FG830 render this guitar ideal for both professionals and budding artists. Let’s learn how or whether the FG830 truly lives up to the Yamaha FG legacy in this Yamaha FG830 guitar review. The FG830 has a Sitka spruce top, which gives the guitar its sturdiness. And the rosewood sides and back make the guitar look a lot more premium than it actually is. The shape is conventional dreadnought, a style which is quite popular within the guitarist community. The neck profile is quite comfortable, and fairly smooth as well. The FG830 comes with a rosewood bridge and die-cast tuners. While the bridge isn’t the prettiest you would see in a guitar, the design gets the job done alright. One aspect that makes the FG830 truly stand out is bracing. Yamaha incorporated its proprietary software to ascertain what bracing pattern will work best keeping all of the dimensions and materials of this guitar in perspective. Having said that, the FG830 is a production guitar, which would need some work before you could get rolling with it. Also, a proper setup and intonation are a couple of things luthiers are better at compared to machines. Therefore, be prepared to visit your nearby guitar tech store for a bit of hardware tuning. Though the FG830 looks affordable, it doesn’t sound like one. There’s good amount of traditional dreadnought sound happening, but the tone’s core is pure quality. Multiple overtones combined with rich projection make this guitar a true force in its price category. The amount of sustenance the guitar could offer was a major suspect before its launch. However, post launch, those concerns have been thrown out of the window. Whether you’re an expert or beginner, the FG830 would meet your requirements. The sonic impact, the most important attribute of a guitar, would pleasantly surprise you. The booming projection makes the FG830 ideal for live or recording sessions. The sound will be audible in the entire room, in fact. The dried woods help the tuning stand out, and expect Yamaha’s analysis technology to offer strong low and mid ranges. If you have never played a guitar before, you would like to play something that’s easy to pick and strum. You would not want something overwhelming to handle right off the bat and also wouldn’t want to put up with a major learning curve. In other words, playability is important. Before you understand playability more, you should first learn what ‘action’ is. Action (on a guitar) is essentially the space between the guitar’s strings and neck. You would be pushing via that space each time you play. Needless to say, excessive action or space isn’t ideal. Also, too little space isn’t good. There must be a perfect ratio. If not, your fingers could get tired (excessive space), or you may hear buzzing noise (too little space). As far as the Yamaha FG830 is concerned, its action and playability are on point. They are ideal for amateurs, as hours of practicing would not tire them down. All amazing features will not matter much if there was no Yamaha branding backing things up. Yamaha is a reputable brand in the world of music instruments, and the quality it offers is something very few companies can match. The FG830 is no exception to this since it exceeds your expectations in terms of both features and build quality. Also, since this is a Yamaha product, you can expect all the incorporated technology and high-quality build to come good for long. If it doesn’t, there is Yamaha’s friendly and professional customer service team that shall field your queries and grievances relating to the same. The Yamaha FG830 also comes in different colors. This is something people who like their guitars looking fancy and flashy would appreciate. The color options are black, autumn burst, sunset blue, sunburst and natural. If you’re a lefthander, Yamaha has you covered with the left-handed version of its FG830. Compared to similar guitars, in terms of features and potential, the FG830 is priced fairly well. And this is in line with the reason why the FG guitar lineup was introduced. The price tag isn’t pocket-friendly, but it is also not the several hundred dollars you would otherwise spend on an equally capable instrument. The product variations add to the overall value too, since the different forms cater to most guitarists’ individuality quite well. As aforementioned, the FG series of Yamaha acoustic guitars has been around for quite some time. If a guitar is to be launched with the FG branding, it better be great or at least stack up well with its famed predecessors. The good news is that the FG830 lives up to those expectations, and even fares better than erstwhile FG guitars in certain departments. Also, how you interpret the guitar’s performance would depend on what you expect from it. Not to mention, the advanced technology incorporated lend to the superior performance of this modern guitar. In short, FG830 isn’t your complete guitar. But you can definitely pick it up now and play it for a few years without feeling bogged down by performance. Based upon feedback submitted by over 60 customers the Yamaha FG830 Guitar has received an average 4.7 out of 5 star rating. We discuss why in this review article.